I did warn you that this was not a week of culinary heights or delights. I apologise. Sort of. As I said yesterday, I visited the Sutton Bonnington farmer’s market and one of the things I did pick up was a ‘small’ loaf of rye sourdough. I say ‘small’ because their small is the size of a normal loaf of bread. I shudder to think of the size of their regular bread. This loaf will last me weeks. Well, if it wasn’t so good and I didn’t now have plans to eat it at every meal, it would probably last weeks. I’m always dubious about new bakeries. Yes, I am a bakery skeptic. (Except in Paris.) I find I tend to be disappointed a lot. The pastries are never as good as they appear and the bread is stale before I’ve had a chance to sample it properly. My new find at the farmer’s market (Elizabeth’s Patisserie) definitely got the bread right. The sourdough sliced through like butter and toasted to equal perfection. And it had the most insane texture – all silky and smooth but in a bread-y way. I don’t know how to explain it properly. You’ll just have to believe me. 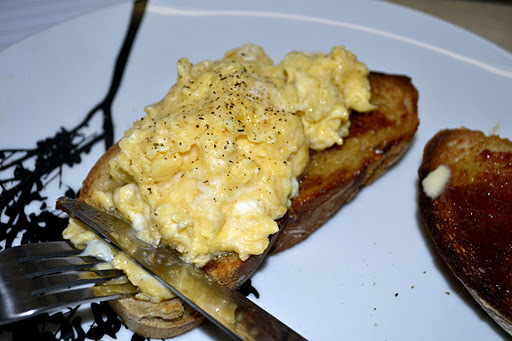 So for dinner last night, all I could manage to conjure up was scrambled eggs on toasted sourdough. But it was a dinner for kings and made me decidedly happy. Suffice to say the rest of my diet this week will be centred on sourdough.